The NoiseSign is a wall-mounted sign that lights up when the noise levels are too high. It can be used to remind staff and visitors in hospitals, libraries and studying areas to keep their noise levels down. Due to its very wide range of operation, 40 to 114 dB(A), the NoiseSign is suitable for most applications. In a hospital, school, or other quiet environment, it would usually be set somewhere in the region of 45 to 60 dB(A) as a reminder to people to keep the noise levels down. For use in differing environments the brightness of the NoiseSign can be adjusted. In a bright area it would be set to its brightest, but for use in a hospital it might be set to a less intrusive level. 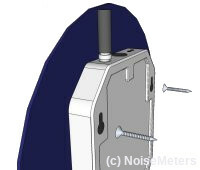 The noise beacon does not work on its own, it must be connected to the NS-QZON NoiseSign. You can connect one, two or three beacons to each noise warning sign. After completing a noise survey and working to reduce the noise at source, many industrial environments suffer with intermittently high noise levels. In such environments it may be unreasonable to ask staff to wear hearing protection at all times, so noise activated warning signs can be used to inform them when the levels are high. One or more NoiseSigns can be mounted at strategic points, set to light up when the surrounding noise levels exceed 80 dB(A) for example. The NoiseSign can be connected to an outdoor microphone system. The microphone is installed outside, connected to the sign that is mounted inside. With this configuration staff can be warned of high sound levels outside (steam valves for example) that may cause complaints from local residents. Music in pubs, clubs, discos and hotels tends to be of a certain volume to encourage the right atmosphere. However, some DJs and live groups can go a bit far, especially as the evening wears on and their hearing becomes dull, resulting in complaints from local residents. The NoiseSign is the ideal way to keep the volume to a level agreed with the local residents or environmental health officer. Noise in hospitals causes patient discomfort and can increase the recovery time. Much of the noise can be avoided if visitors and even staff are reminded of the issue. Noise activated signs mounted in the corridors or rooms are an excellent reminder. The brightness level of the sign can be reduced for use in low-light areas where a bright sign would disturb. Mounted in classrooms, communal areas and especially in cafeterias, the NoiseSign gives a very clear indication that the sound levels are too high. In the classroom this makes for a much better learning environment. Elsewhere, it just makes it a more pleasant place to be for the majority who do not want too much noise. Libraries are usually quiet places, but when people start chatting the noise levels can easily increase. It can be embarrassing to "Shhh" somebody at such times, so a sign that does it automatically is ideal. The NoiseSign can be set to a very low level, lighting up when too much noise has been made, rather then when somebody else's perception suggests that it is too loud. The NoiseSign, with the text SHHH! - Quiet Zone is the perfect reminder for staff and visitors that they should keep their noise levels down. Just the presence of the NoiseSign is often reminder enough! Too much noise in a hospital or medical center causes patient discomfort and can result in longer recovery times. The noise in question comes from visitors, staff, patients and from the movement of equipment. Noise Warning Signs take the strain out of reminding people to keep the noise levels down. Noise Signs are most popular in NICU and neonatal units, but are valuable on other general and intensive care units to remind not just the visitors but also the staff and patients to keep their noise levels down. The perfect location for a sign depends on the layout and the acoustics of the area in question. The most important aspect of the NoiseSign is that it reminds people to keep the noise level down, so it is best to mount them where they are clearly visible to anybody entering the room or area. Often the Nurses Station is a good place to position one unit as this is in view to anybody visiting and also to constantly remind the staff. There is no simple rule about the sound level trigger setting. Hospitals have different ambient noise levels and different acceptable limits. An intensive care unit will have a much lower noise threshold than a busy areas dealing with less critical illnesses. The best way to find the comfortable limit for an area is to set the sign up to 55 dB, run it for a few hours, or even a few days, and get a feel for whether it is being too sensitive for the given environment or whether it is letting people get away with too much. Adjust up or down by a few dB as needed. A level of 45 to 55 dB is common for neonatal and intensive care areas and 50 to 60 dB is common for other areas, although it does depend a lot on the acoustics of the areas in question. 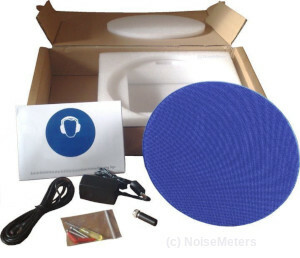 Most of the noise warning signs that NoiseMeters supplies are for use in neonatal, and intensive care units. Babies in intensive care are particularly sensitive to high noise levels and to the increased stress that they cause. Noise from visitors and staff is best dealt with using a device such as the NoiseSign as it is not influenced by the complicated human perception of noise. If it is loud, the sign will light up, whoever is making the noise. Neonatal units, like most hospital environments, tend to be very poor acoustically due hard, reflective surfaces. Beds are often closely spaced, visitors can talk loudly (especially the younger ones) and staff have to work quickly and move equipment about. Add to this the incubators being opened and closed, occasional tapping on the lid and items dropped accidentally and the noise levels soon become unpleasant for the baby. One of the biggest culprits is the alarm, which is clearly essential, but as the background noise levels get higher the alarm has to be louder still. A quieter background allows for quieter alarms. Some such research can be found in the links below. To remind staff and visitors to be quiet. Ideal for hospitals, libraries, schools and offices. NSR-QZON The NoiseSign can be connected to up to three remote display signs. When the NoiseSign lights up, the remote signs light up in the same way and for the same period of time. 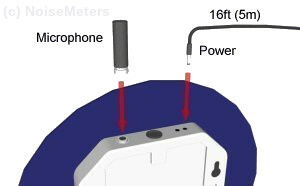 Each remote unit comes with a 10 m cable to connect back to the master NoiseSign or between remote units.